Mt. 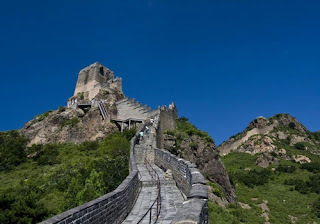 Jiaoshan is the first mountain the Great Wall stretches across on its westward journey from the coast of the Bohai Sea. The huge, jagged rocks on the mountain look like a dragon’s horns, hence its name Jiaoshan, meaning a mountain resembling horns. Hanmenguan is a small pass from where the Great Wall turns north and winds up to the ridges of Mt. Jiaoshan. Built during the reign of Emperor Hongwu (1328-1398) of the Ming Dynasty, the Jiaoshan Great Wall extends about 1,500 meters, from Hanmenguan at the foot of the mountain to Dapingding, the highest point. There are three watch towers and four beacon towers. In 1986 the pass was renovated and a stone plaque inscribed with the name “Hanmenguan” was added above the brick arched gate of the pass. The land outside the pass is smooth, and might have been cultivated by the local garrison, as in the Ming Dynasty, the garrisons had to support themselves by part-time work on state-owned tracts called State Farms. This section is built of locally quarried rock and bricks. The height of the wall ranges from seven to ten meters, following the contours of the mountain itself, and the average width is four to five meters, although at one point it narrows to just 2.7 meters. The biggest watch tower is on the summit of Jiaoshan. The two-story structure is built in four sections, with the top forming a rough square 10.4 meters by 10.2 meters. Along the top are watch holes and embrasures for shooting arrows. Halfway up the mountain stand fortifications of Jiaoshan Pass, built in the early years of the Ming Dynasty. The pass town is an irregular quadrilateral built of rocks and stone, with a gate in the southern side and a path leading to the foot of the mountain. In the town there used to be a building five bays wide and two bays deep for storing ammunition and provisions. The Great Wall climbs up to the peak along the ridge of from the Hanmen Pass. In this section five watchtowers and battle platforms were built. This section is also typical of the parts of the wall built on steep terrain, with the outside wall higher than the inside one for better defense. The No.1 Watchtower and the Zhenlu Beacon Tower built on the top of peaks, together with the Hanmanguan Pass, form an interdependent complex defense system. The Zhenlu Beacon Tower on the top of Mt. Jiaoshan was built in 1565, during the Ming Dynasty (1368-1644). In plan it is an oblong, with the top smaller than the base. It is encased with bricks and rocks, its solid interior filled with a crushed mixture of stone and clay. It stands on the summit of the mountain, ready to report the movement of enemies at any time. Halfway up the temple lie Qixian Temple, also known as Jiaoshan Temple, built during the early Ming period. Many scholars and high-ranking officers, including distinguished calligrapher Xiao Xian, Vice Minister of War Zhan Rong and Investigating Censor Zheng Ji, once lived and studied here. As a result, the temple was crowned with the title “Cradle of Shanhaiguan Culture”. In rainy periods during the summer and autumn, it is common for it to be raining below the temple and sunny above it. Dapingding, the summit of Mt. Jiaoshan, is an ideal place to watch the sunrise on a fine day. Looking east from the hilltop at dawn visitors can see the red sun leaping out of the sea, and the sea water turning red, mirroring the color of the sky. The scene is known as “Lotus Flower Cradling The Sun”, because the shimmering red sea water looks like a blossoming lotus flower, on which sits the sun.